The Pie Dough Club is GT Pie’s rewards program where members earn points – one for each dollar purchased. Points convert to “Pie Dough Bucks” that can be used for purchases in our shops. Register your membership online and enjoy additional rewards and surprise perks along the way! A free slice of dessert pie when you register your card. Birthday reward – your choice of a slice of pie à la mode or a 6” mini fruit pie. $10 in Pie Dough Bucks will be added to your account for every 150 points earned. 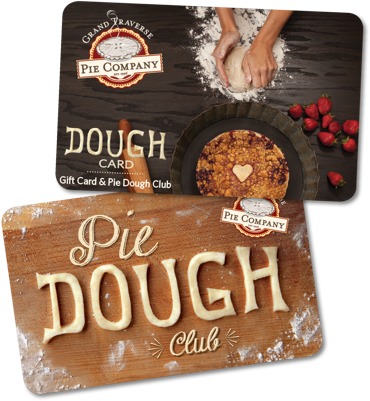 Load or auto reload your Pie Dough Club card with a stored dollar value using your credit card. Download the Pie Dough Club App and check in at any GT Pie location to conveniently pay while earning rewards. To learn more details of the Pie Dough Club see the Frequently Asked Questions.